My boys aren't big into team sports, but that is mostly because we really travel too much to dedicate that much time to making every game and practice. That said, my boys are extremely active, especially during our momentous summer trips. Did I mention that this year's 90 day road trip kicks off in less than two months? With all this adventure travel, camping and activity comes our fair share of cuts, scrapes, bruises and yes, the occasional broken bone. That's why one of the most important things I carry with us everywhere we go is our first aid kit. The boys and I have traveled all over the country over the last few years. We have stayed in more than 30 states, tackled rivers, mountains, abandoned mines and so much more together. Often more than this tired mom has bargained for. I spend a lot of time researching products and choosing only the best items to make up our on-the-go safety and first aid kit. You wouldn't think that sand is dangerous, but when you crash and burn when sand sledding, it can give some pretty nasty scrapes. Joshua tried zip lining for the first time this past summer and loved it. He also ended up with a cut on his hand somehow. Seems like the boys don't even notice the cuts and scrapes on their knees when they scrambled up and over rocks on our hiking excursions. You're not safe from injury in a kayak either. My 11 year old was sporting a pretty nasty popped blister after our outing on the river in Virginia. I won't even tell you how many cuts and scrapes I had after the boys "talked" me into taking this trail up to an abandoned mine in the side of a mountain. All of this activity and our unfortunate bumps and bruises lead me to look for a better way to treat these injuries. That's where Puracyn® Plus Duo-Care Wound and Skin Cleanser comes in. I was sent a sample of this product to try out, and it has been amazing so far. Trust me, not a week goes by in this house of four boys without some kind of scrape or scratch to treat. 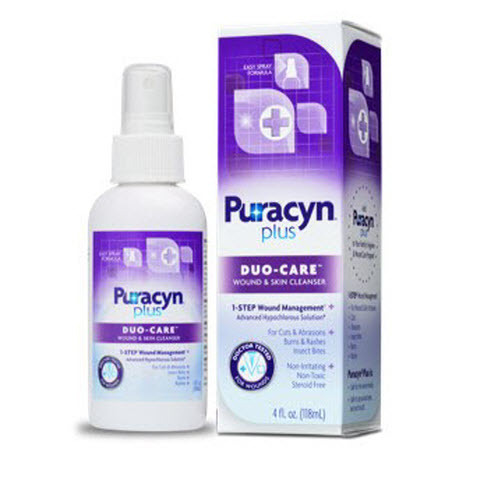 Puracyn® Plus Duo-Care Wound and Skin Cleanser is an all new "first step in first aid." It is more effective than soap and water, and less irritating than products like peroxide or alcohol. Also, unlike other products, it can be used anywhere, even the ears, eyes and mouth! The easy, hands-free spray application of Puracyn® Plus thoroughly cleans minor wounds, eliminating the need for running water in the critical first step of cleaning a wound. Puracyn® Plus is available in a 4oz. plastic, spray bottle at Rite Aid and Walgreens for $14.99. Another product we are adding to our adventure travel first aid kit is the Puracyn® Plus Foot Wash and Skin Cleanser. Puracyn® Plus Foot Wash & Skin Cleanser is the safe, effective, FIRST step in first aid for foot sores and irritations, blisters, dry and cracked feet, and rashes. Trust me when I say there is nothing worse when you want to get out on the trail and hike, than sore feel due to blisters. This product will hopefully help us avoid that issue. Want a chance to win a Puracyn® Plus Sports Emergency Kit complete with a $50 Gift Card to your choice of Sporting Goods Store? Now through March 27th, you can enter the Play to Win with #TeamPuracynPlus Giveaway! You can visit the Puracyn® Plus Facebook page to enter, and three lucky winners will be randomly selected to win a prize pack! To learn more about the Puracyn® Plus, LIKE the brand on Facebook and follow the brand on Pinterest.